The trade deadline came and went without a move from the Pittsburgh Penguins for the first time in General Manager Ray Shero’s tenure. According to Jonathan Bombulie, it was also the only time since 1988 the Penguins were idle on deadline day. They weren’t alone. Monday afternoon was relatively quiet around the league with just 16 trades happening prior to the 3pm deadline. With a handful of minor holes on the roster left unfilled, the focus now turns to Sidney Crosby and his potential return from concussion and neck problems. According to multiple reports, the team has taken the long-term injury exception on Crosby but he is still eligible to return at any point in the regular season or playoffs. After seeing the high prices being paid for players in the days leading up to the deadline, we shifted our attention from Gaustad to Pahlsson as a possible third-line center option for the Penguins. Shero didn’t acquire either player, as Gaustad went to Nashville and Pahlsson made his way to Vancouver. Buffalo reportedly received two offers including first-round picks for Gaustad. That’s outrageous. Gaustad adds size and grit and should give the Predators shot in the arm, but he’s not the second-coming of Eric Lindros. The Canucks sacrificed a pair of fourth-round picks for Pahlsson, not bad for a veteran center with Cup experience. Perhaps the Penguins had zero interest in Pahlsson, but I thought a fair price for Shero to pay would’ve been the fourth-round pick he received from Columbus in the Mark Letestu trade earlier this year. Vancouver obviously paid slightly more than that and for good reason. They needed a checking line center to replace Cody Hodgson, who was surprisingly dealt later in the day to Buffalo. In Allen’s case, the Hurricanes would like to stop the constant rebuild at some point and GM Jim Rutherford seems to believe he can get the defenseman signed to an extension before the summer. Rutherford said last week that we often forget to consider the price to replace a rental player that’s dealt away. Carolina would’ve gotten a nice return for Allen, but Rutherford would need to surrender significant assets this summer to find a replacement. Colorado’s situation with Jones sheds light on another deadline variable that’s easy to forget: the salary cap floor. This is the first year I’ve really noticed the cap floor becoming a serious factor in deadline situations. Last year the salary cap ceiling unexpectedly rose $4.9m to $64.3m, an increase of about 8 percent. The floor is always $16 million below the ceiling, however the same $4.9m increase had an 11 percent impact on the floor. When you consider the original floor coming out of the lockout was $23m, the payroll demands on the league’s small-market teams has more than doubled in just six years. Don’t be surprised if the league tweaks the rigid $16 million spread between the ceiling and floor in the next CBA. As we mentioned in our trade deadline preview, sometimes under-the-radar moves have the most impact come playoff time. Boston made a big splash by acquiring Tomas Kaberle last year only to have the veteran become more of a liability than an asset during the team’s Cup run. Instead, it was Rich Peverly and Chris Kelly who gave the Bruins the kind of depth they needed to win four difficult playoff rounds. Looking at the trades that occurred on Monday, the Bruins may have struck gold again. 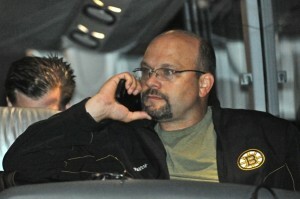 Boston GM Peter Chiarelli acquired defenseman Greg Zanon from the Minnesota Wild in exchange for prospect Steven Kampfer. Zanon is a shot-blocking machine and his hard-working style is made for playoff hockey. He’s also spent his career with teams like Nashville and Minnesota and will add a Stanley Cup hunger to the Bruins’ dressing room. It’s possible the Penguins were interested in Zanon given his Nashville connections to Shero, but the price was well out of the Penguins’ range. Kampfer is a promising youngster and should become a nice player for Chuck Fletcher and the Wild. Chiarelli has learned you sometimes have to take those risks at deadline time though. Defending a Cup is a grind and I think the Bruins will slip up at some point in the playoffs, but if they do make a run we might be talking about Zanon as the key February acquisition that got them there. After a disappointing fall down the Eastern Conference standings, the Washington Capitals and GM George McPhee should’ve been active on Monday, right? The Capitals’ playoff hopes are obviously dim if Backstrom’s season is over, but what about a deal for Buffalo’s Derek Roy? The center has one year left on his contract at a $4 million cap hit and would’ve given the Caps a nice offensive boost they desperately need. Can the Penguins Win the Cup? The Penguins most likely playoff path still heads through Philadelphia, Boston, and New York, and I’m concerned about their size and toughness. All three potential opponents can roll four physical lines and three defensive pairings that could wear down the Penguins over a seven-game series. It wasn’t worth overpaying for a player like Gaustad to address the roster issue, but the Penguins will need more outstanding goaltending from Marc-Andre Fleury if they want to make a run. 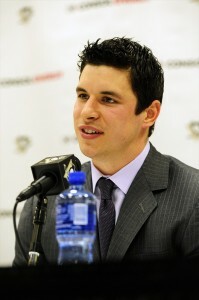 A healthy Crosby certainly makes the Penguins a favorite out of the Eastern Conference. Without him, Pittsburgh is just another talented two-line team. Can Paul Martin and Zbynek Michalek raise their games over the final stretch of the regular season? 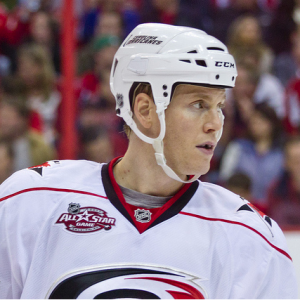 Can Jordan Staal continue to add secondary scoring to his usual duties as a shutdown center? If the answer to those two questions is yes, Pittsburgh will be in good shape.